If you can live without the rev-counter, BMW’s R nineT Pure offers lots of fun in a quirky, genuinely-retro package. 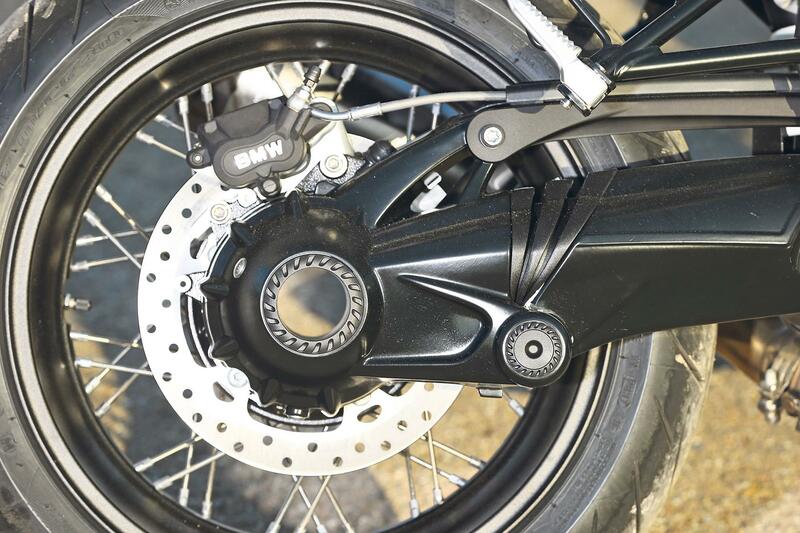 While BMW say the bike is built for modifiers, many owners will be happy just as it is. It’s a credible machine at a sensible price and has all of the nice touches you’d expect with a BMW. Stripped-back, raw and quite aggressive. It’s a blast to ride, and sounds fabulous, but this attitude won’t appeal to everyone. The bike shares its chassis with the R nineT Racer, Scrambler and Urban G/S, which has a frame with a slightly kicked-out headstock to accommodate the Scrambler’s 19in front wheel and a simplified rear subframe design. The riding experience is typical R nineT – a nimble, accurate chassis combined with a friendly motor and more than enough performance to make this is a credible motorcycle. The handling is pretty playful, too. The chassis is virtually identical to the Racer’s, but the taller, wider bars impart more leverage, making the bike feel more nimble. The downgraded suspension does its job well and even though the forks are a little soft there’s plenty of feel. On standard settings the rear can feel a little bit uncontrolled, but the rebound-adjustable shock should have the range to dial this out. The chassis doesn’t tax your brain, but gives you confidence to push hard enough to have fun and the lack of quirks and foibles mean that it will be a great bike for new riders, too. 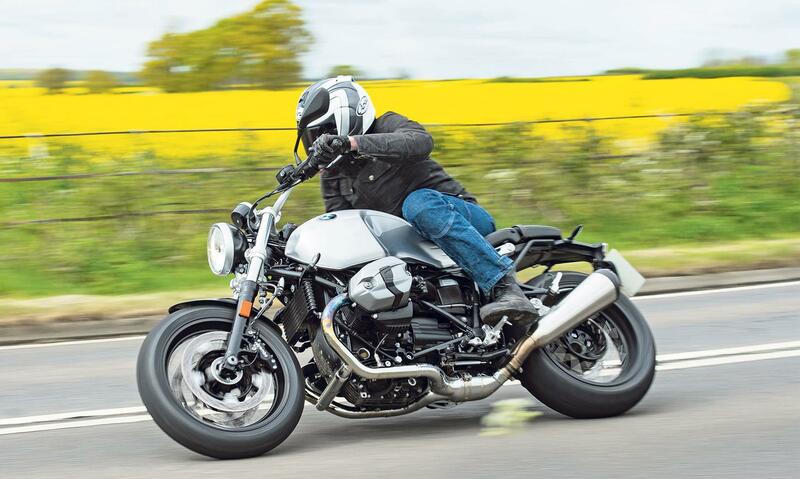 To be honest, it offers everything the more expensive R nineT does when it comes to dynamics and is a more convincing retro bike too – for many the superbike-style suspension and brakes of the more-expensive R nineT jar against its design brief. The Metzeler Z8 Roadtecs that this bike came with were beyond reproach, even in our terrible test conditions. But the Pure is happiest when it comes to relaxed cruising in the sun. With its straight-backed riding position, visibility is good and gives the chance to just sit back and enjoy the view.  It is also an excellent urban bike with great natural balance. Through the slippery town streets of a wet Spanish resort, the bike felt just as sure-footed as it did in the Andalusian mountains. 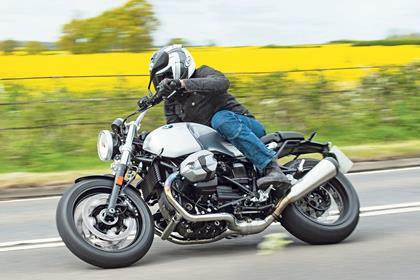 The R nineT’s 1170cc, 108bhp Boxer twin is as lively as it is torquey and has a playful kick at the top-end that encourages you to ride faster than the retro looks suggest. Before you know it, you’re chasing that imaginary red line. 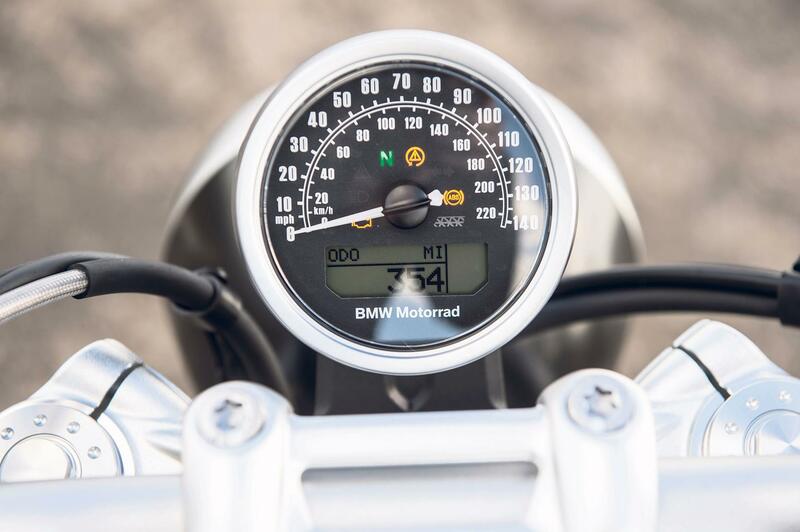 We say imaginary because of course the Pure doesn’t have the rev-counter, or the gear indicator you get on the Racer or the top R nineT. And to be honest, you do miss it – even though the motor is flexible enough that it doesn’t matter too much which gear you’re in. From the moment the boxer fires into life though you can’t help but love the Pure’s attitude. It’s loud, raw and where rivals like the Honda CB1100EX cosset you on your ride, the Pure grabs you by the scruff of the neck and drags you along whether or not you are in the mood for a fight. Although it may lack the toys of some of its stable mates, the Pure is beautifully engineered, styled and put together. 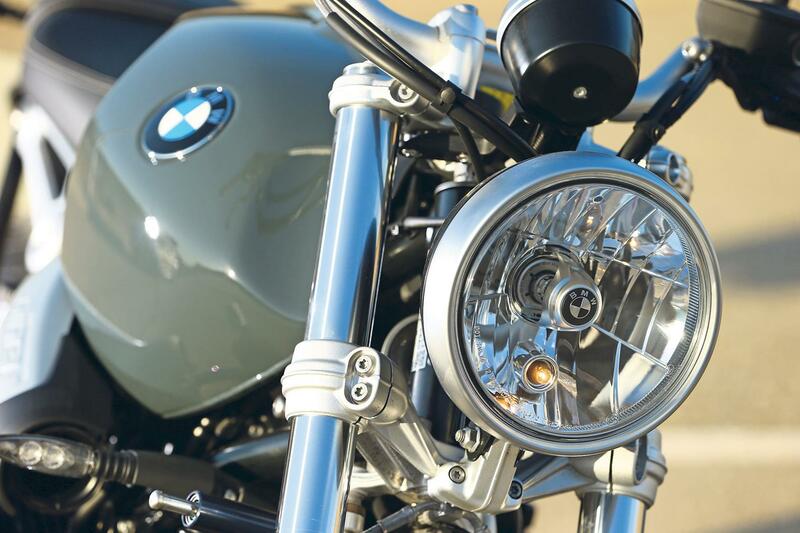 Unsurprisingly, owners of the standard R nineT offer nothing but four and five stars for reliability, however offer warnings about expensive BMW parts, should something go wrong. 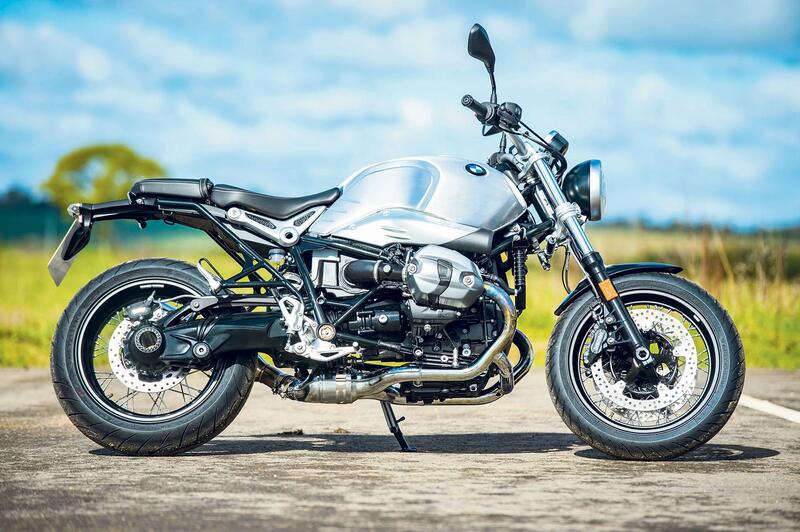 Compared to the big-money £12,220 R nineT, it has a 43mm non-adjustable right way-up fork rather than the S1000RR-derived Sachs inverted items of the more expensive bike. It also has axial-mount Brembo brakes rather than radial calipers, and a steel, rather than aluminium, fuel tank. There’s also a single clock, with no rev counter. As well as being easy to modify, the fact that the bike has very cheap PCP deals means the Pure is a bargain entry into R nineT ownership. Its only real problem is its Racer brother. If you can stand the riding position, the Racer is sexier, better equipped and just £800 more. As standard the Pure comes with very little in terms of equipment, missing a rev counter, rider aids and upside down forks. The idea of this being that it's the perfect 'blank canvas' for riders to create their ultimate custom R nineTs. Usually running cast ally wheels, our test bike came with spoked wheels (£330), traction control (£330) and LED indicators (£100). The spoked wheel option suits the bike, even though it means you have to run tubed tyres. Front suspension 43mm right-way-up forks, non-adjustable. 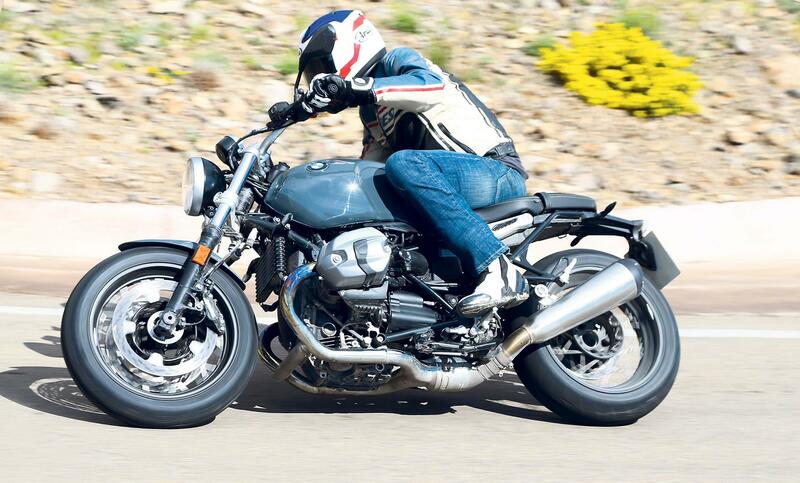 2014: The original R nineT is launched. It's a no nonsense, upright roadster capable of tackling sweeping bends and carrying an impressive turn of speed from its air-cooled 110bhp 1170cc boxer-twin engine. Riders get ABS as standard and no other rider modes. R nineT Racer: Again using much of the same equipment as the rest of the R nineT family, the machine offers plenty of characterful poke from its boxer twin motor alongside a set of sleek café racer plastics that instantly take you back to the 1970s. R nineT Urban G/S: Little more than a re-styled R nineT Scrambler, the Urban G/S oozes urban spirit and charm. With the same chassis and wheels as the Scrambler, it handles exactly the same as its donor bike, with far more agility than you would expect from this genre. R nineT Scrambler: Often unfairly cast off as nothing more than a BMW styling exercise, think of the Scrambler as a great looking lightweight version of the GS that is pleasingly lacking in the fussy electronics that the latest water-cooled model is so adorned with. Read the full history of the BMW R nineT range today. 1 owner has reviewed their BMW R NINE T PURE (2017-on) and rated it in a number of areas. Read what they have to say and what they like and dislike about the bike below. The Pure is rewarding, fun, sounds good and I look forward to my next ride every day. It does get uncomfortable after an hour or so and has tubed tyres, though. The brakes and handling are good and the bike is very manoeuvrable. The ride quality could be better. I love the engine characteristics, which make the bike easy to live with and torquey with plenty of real world low down power. The bike is very well built and finished to a high standard. It has never let me down. Great value because it is the best, most rewarding bike I've owned. The heated grips are good but there's no fuel gauge, nor a tyre pressure monitor. Bought from BMW and it was a very pleasant experience. MCN's Senior Editor, Matt Wildee has been living with BMW's new-for-2017 R nineT Racer this year. "More than just retro looks and fashion, it goes, stops and handles as well as the best roadsters out there"
"Very much the supermoto fantasy made metal"
"BMW has built a bike that can handle almost everything"